Korean War - WHY WAR? The question "why war," in Korea, extends back in time before the Korean War erupted in 1950. As this illustration by John S. Pughe depicts, Korea was already in trouble early in the 20th century when Japan decided to occupy the Korean Peninsula. Curators at the Library of Congress, where this image is maintained, provide some context for it: “Illustration shows Mars, the Roman god of war, waiting for the establishment of protocols and the Japanese occupation of 'Korea' to be completed before the sands in an hourglass shift from 'Peace' to 'War'; 'China' sits quietly on the left." Korea, a small country numbering 30 million people in 1950, lies at the point where three great Asian powers (Japan, China and the former Soviet Union) meet. At the end of WWII, preoccupied with Soviet intentions in western Europe, the United States attached little strategic importance to Korea. America did assist South Koreans in their national elections and helped them to form the Republic of Korea (ROK). The Soviet Union, on the other hand, took an active role in governing North Korea and in forming the Democratic People's Republic of Korea (DPRK). The United States Army withdrew its combat forces from South Korea in 1949 but left a military advisory group to assist the South Korean Army. In early 1950, the Soviets supplied weapons to (and assigned several thousand Russian soldiers as trainers for) the North Korean People's Army. Armed clashes between North and South Korea were common along the 38th Parallel, but in June of 1950 American observers did not anticipate an invasion of the South. While "Western" powers were thinking it would never happen, North Korea was planning to invade South Korea in order to reunite the Korean Peninsula. The invasion began on June 25, 1950 when North Korean soldiers crossed the 38th Parallel - the dividing line between the two countries - thereby igniting a war. By September, U.S. soldiers were aiding the South as depicted in this image where they are using a bayonet tip and a screwdriver to search for hidden mines on the road from Changnyong to the Naktong River. Image online, courtesy U.S. Department of Defense. Determined to reunite Korea by force, the North invaded the South on June 25, 1950. 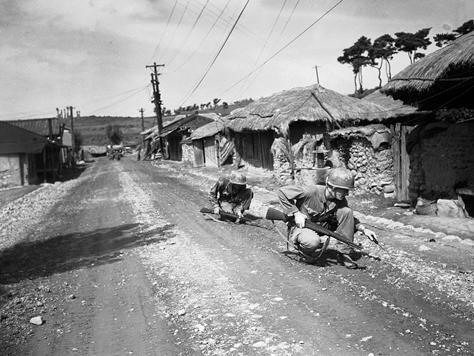 South Korean troops, fighting in July and August with relatively few reinforcements, were soon exhausted. Civilians, ordered to evacuate their villages by the South Korean Army, became refugees as they moved south in the P'ohang sector on August 12, 1950. Bos, Carole "WHY WAR?" AwesomeStories.com. Jun 01, 2008. Apr 25, 2019.